My sincerest condolences to all those who knew him, here and beyond the BBS. I just got the news from Mike. Terribly sorry for your loss, my condolences to you and your family. Greg was always super nice and always great to talk to. I think the last build we did together was a DC600 with custom controls a while back. He was also in on our Vader run which was a huge milestone for the company. Guys like Greg are the reason why we are where we're at today with the dedication, support, and word of mouth promotion. Always took time to tell people about us and post pics of his guitars whenever he could, especially the famous KE that he ordered. I remember when he was trying to put together the build for what would eventually become Mystique, he got so many no's from both Mike and I because a lot of what he was asking for just wasn't in the cards or just wasn't something that we normally did. Some of it was just downright off the wall for us at the time with stuff we didn't think was possible but he remained persistent and steadfast with his vision. He knew what he wanted and I'm glad he persisted at making his vision come to life. At some point during our conversations about this potential build it got to where I told him that he had to talk to Jeff about this guitar because most of what he wanted wasn't something I could help him with and that this was all something that only Jeff and the Kiesel Edition build would probably accommodate and even that was potentially a stretch. 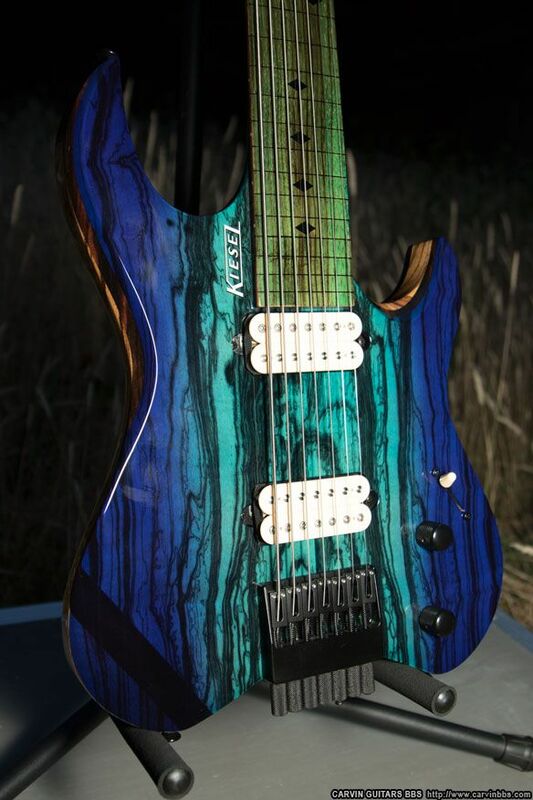 We thought it would be a flat out no from Jeff because Greg wanted to send in his own pale moon, do some crazy colors, do some stuff with the wood layers on the body and how they would interact with the 5 piece neck, etc. To our surprise Jeff said yes and after a bit of a wait to clear the KE waitlist they got to figuring out what could and couldn't be done. The pale moon I think was very thin and it warped on its way here so we had to do what we could to make it workable as a top and back wood. The entire time I kept getting surprised by what we were able to do on his build as it was going through the process. While they had to revise the original vision a few times, as you've all seen the final product was definitely something out of this world and I think it is one of the craziest builds we have ever done and probably will ever do which says a lot considering what we put out on a daily basis. While I can't speak for the company regarding this I personally feel that his build was one of the ones that helped us to some degree in not only helping other people see what you could potentially do with Kiesel but also helped pushing the boundaries on what we ourselves as a company thought we could do for builds. He will be missed for sure, I hope he's rocking out and having a good old time wherever he is now. Really sad. I had limited interaction with him but one of the things that kept me interested in hearing from him was his unique voice, he was one of the rare guys that posted that was interested (and pretty sure it was him) in fretless electric guitar, which is as unique as it comes. And of course his unforgettably beautiful guitars. I recall him mentioning there was some health issues that he was going thru at least a year or more back. I can only say I hope he didn't suffer much, and I wish peace on your family. I'm really sorry for the loss and thanks for creating this thread. Oh man I am so sorry to hear this news. Thank you for taking the time to let us know. Greg had a great vision of what he wanted in that build and I am glad Jeff and team Kiesel were able help him bring it to fruition. I hope it brought him joy.